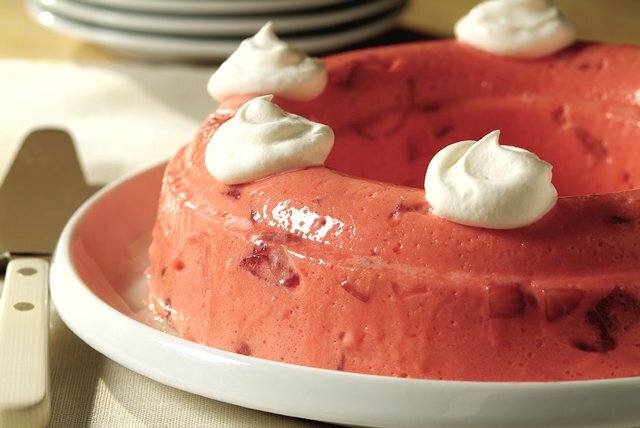 Strawberry flavor gelatin and chopped fresh strawberries make this creamy fruit mold a strawberry lover's dream dessert. Stir boiling water into dry gelatin mix in large bowl at least 2 min. until completely dissolved. Stir in cold water. Refrigerate about 1-1/4 hours or until slightly thickened (consistency of unbeaten egg whites). Gently stir in 2 cups of the whipped topping with wire whisk until well blended. Refrigerate 15 min. or until thickened (spoon drawn through leaves definite impression). Stir in strawberries. Pour into 6-cup mold. Refrigerate 4 hours or until firm. Unmold. Top with remaining whipped topping. Store any leftover gelatin in refrigerator. Dip mold in warm water for about 15 seconds. Gently pull gelatin from around edges with moist fingers. Place moistened serving plate on top of mold. Invert mold and plate; holding mold and plate together, shake slightly to loosen. Gently remove mold and center gelatin on plate.